Everyone is talking recycle, upcycle and beautify at the same time! In constant pursuit of beauty, I read an article in the Times Magazine about Lewis Miller‘ s Flower Flash Sites in the big cities of New York and the likes, I was very impressed with his talent and vision. You can find a little video of his work here https://www.bbc.co.uk/sounds/play/p06llh0l. With these projects, he aims to reflect on natures mutability. He has been featured in the NYT Magazine https://www.instagram.com/p/BclOQjwgNzw/?taken-by=tmagazine. We were inspired by his color explosions and took it as a starting point of our new Spring Summer Collection. Juxtapositioning colourful flower prints with urban geometric and more toned down colors. 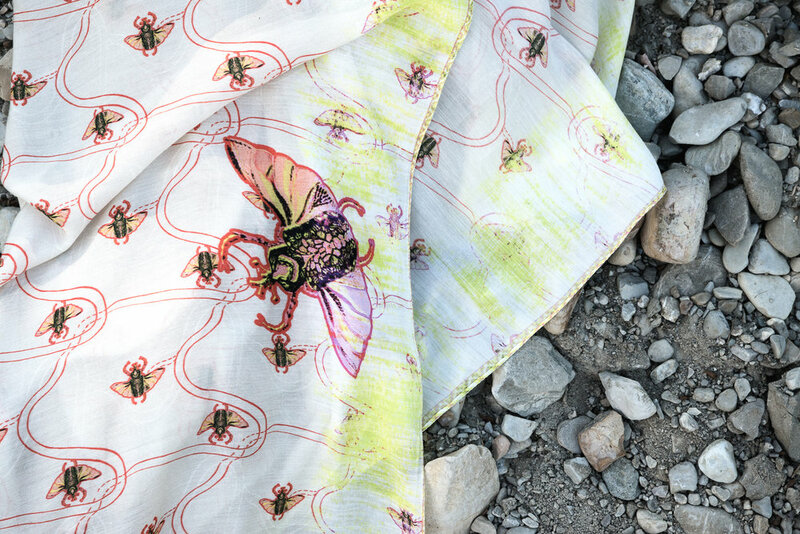 Staying true to Opaline s quirky nature- we inserted the Scarab into a few prints. An ancient symbol of Eternity:-) You never know when that will come in useful!